It’s the fourth-annual High-Adventure Week here on Bryan on Scouting. This week is all about the once-in-a-lifetime experiences awaiting Scouts and Venturers at the BSA’s four national high-adventure bases. Plus, we share tips for securing your spot in 2018, 2019 and beyond. That group of teenagers singing Backstreet Boys while backpacking the final miles of a 70-mile journey? The year was 1999. The place: Philmont Scout Ranch, the BSA’s hiking high-adventure base in northern New Mexico. It was the final day of our Philmont trek, and we were a little loopy and a lot tired. As we hiked down Tooth Ridge, I have a distinct memory of the entire crew singing “I Want It That Way,” that year’s hit from the boy band. As the Philmont base camp began to materialize in front of us, the singing ceased. We fell silent, realizing what we’d done. We made it. We had conquered Philmont’s legendary trails. The group of individuals became a team that summer. Each of us left Philmont with the knowledge that we were prepared for life’s toughest challenges. In 1999, my Philmont crew and I unlocked achievements no videogame can ever replicate. In 2018, 2019 and beyond, you can start your own Philmont story. The base is best known for its seven- and 12-day treks. The treks challenge participants mentally and physically. They include stops at several of Philmont’s staffed backcountry camps, offering a pinnacle experience that participants will remember all their lives. There are also excellent individual opportunities for young men or young women who can’t come with a full crew. Or you can bring the whole family to the Philmont Training Center, where you’ll bolster your Scouting skills while your spouse and children enjoy a week of fun. 2018: The online lottery for 2018 slots closed in 2016. However, select slots are open for seven- and 12-day treks. Click here for a live look. 2019: Slots in 2019 will be allocated through an online lottery. The lottery window opens at 9 a.m. MDT on Oct. 25 and closes at 11:59 p.m. MST on Nov. 15. The lottery-based registration process gives everyone an equal chance at some of Philmont’s most popular adventures, most notably seven-day treks throughout the summer and 12-day treks in June. Interested? Register during the lottery window to give your crew the best chance. Enter the lottery at this link. If schedules or other factors prevent you from getting a whole group to Philmont, that’s no problem. Scouts and Venturers can register for Individual Treks. This is a great way to experience Philmont without a crew — and meet lifelong friends. Individual treks typically have wider availability than seven- or 12-day treks, and participants become strong candidates for future Philmont staff positions. Register for 2018 treks and learn more at this link. Though this post primarily focuses on the camping side of Philmont, I must also mention the “other” side of the road: the Philmont Training Center. At PTC, more than 6,000 Scouters and family members attend a conference each year. 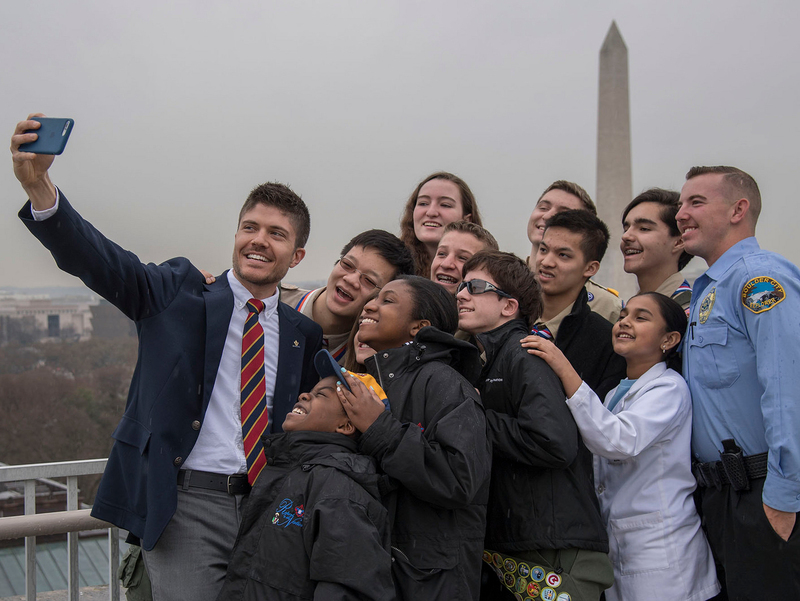 In one of the best settings imaginable, they learn about the latest Scouting tools and techniques, share ideas with fellow Scouters and interact with experienced faculty members. Register for 2018 PTC courses at this link. PASS and PAW: Units planning to come to Philmont in the future can catch one of the remaining Philmont Advisor Skills School or Philmont Advisor Workshop events in 2017. Learn more and register here. Philmont is open all year long. Learn more about Autumn Adventure and Winter Adventure. Whether you’re a frequent Philmont-er or are still dreaming of your first visit, there’s gear you’ll love at the award-winning Tooth of Time Traders. Philmont has begun hiring staff for the 2018 summer! Get your application in early, as they hope to hire most positions by March 1, 2018. You can own an Authentic Philmont Saddle and help Philmont purchase new saddles for thousands of Scouts to enjoy. Thanks to Dominic Baima for the info. Photos from top: Evan Winter, Madelynne Scales and Austin Wilson.